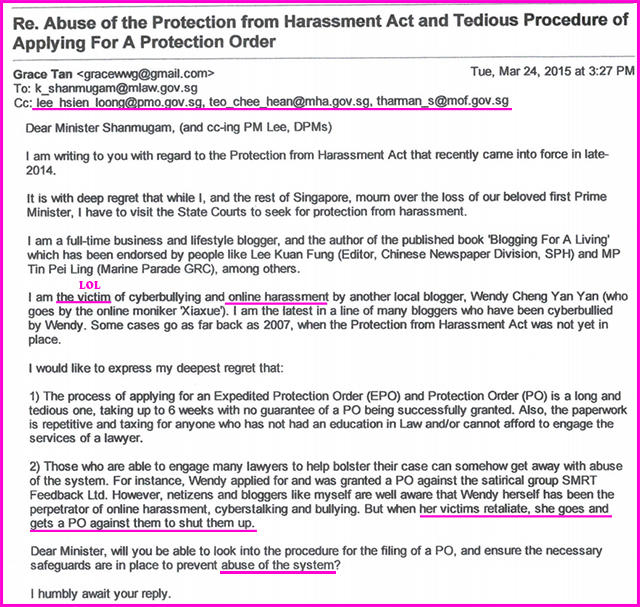 Some time ago I received an email informing me that someone named Grace Tan was applying for a Protection Order against me. At first I was like "Huh? Who is that?" then as I read on, I remembered... I replied this person's offensive comments about me some time ago on facebook. She is a supposedly award-winning blogger who wrote a book on how to blog for a living and a blogging coach who conducts blogging workshops that cost $558. How can it be, she has 306 followers on twitter and 558 followers on instagram! Yes, she's definitely very popular and very qualified. As I read Grace's Originating Summons and affidavit, I actually laughed out loud. She actually put in a medical claim that I caused her to have loose stools. Just when I was beginning to think I had no power, I now know I can cause someone to have diarrhoea just by the words I write. Wow! 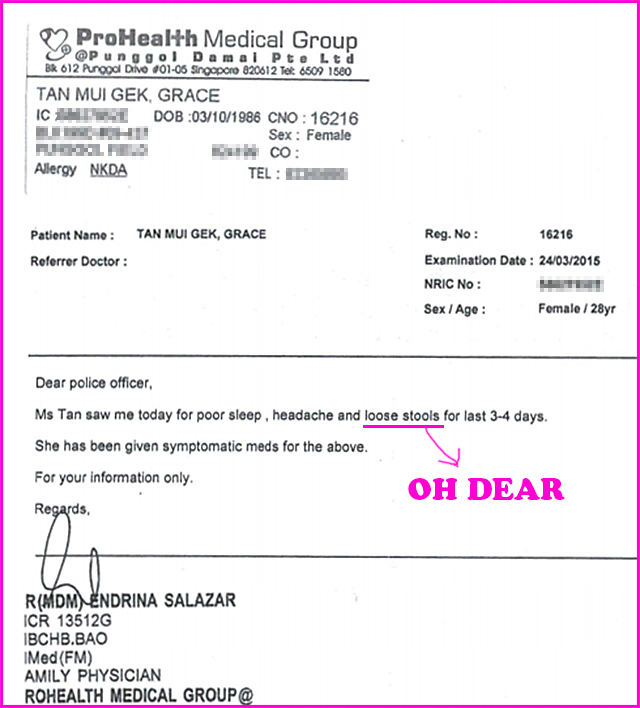 The medical report Grace Tan submitted could not prove that I'm the reason she suffered from her wet bowels, headache or insomnia. I'm not quite sure the point of her putting it in (although I'm sure having loose stools is a very distressing affair indeed). About 2 weeks ago, April 15, was the date of the hearing. Some of you who are old readers might remember him from old blog posts because we used to be close friends! But friendship wasn't the reason I chose him, I chose him because he happens to be well versed in the Harassment Act when all the other lawyers I found didn't know much about it as it is so new. Here's the article he wrote for the Law Gazette about it. You are wondering about how the hearing went? I will tell you later, but first, I want to tell you the whole story first. It's gonna be a super long blog post, don't say I didn't warn ya. 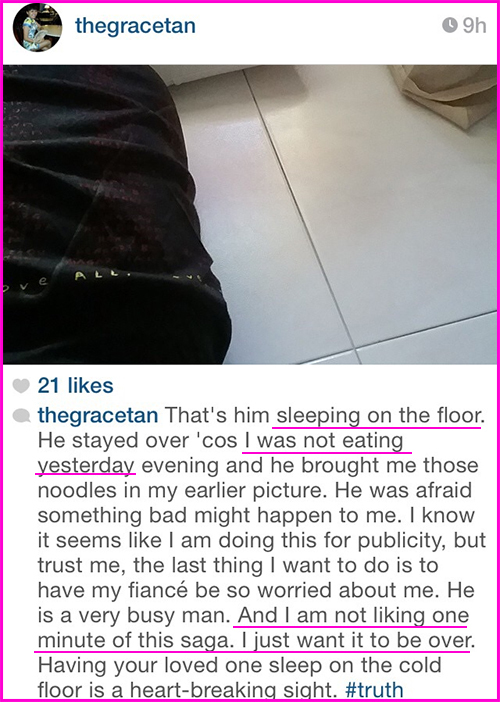 Since Grace applied for the Protection Order and publicized it on all her social media, there have been many news reports on the issue. (Straits Times)/(Mothership)/(CNA)/(Channel 8 news) - Just for a sampling. I have kept resolutely quiet about it because anything I say can affect the outcome of the case. How, exactly, have I harassed her? How, exactly, have I cyberbullied her? So much so that she needs to apply for a freaking Protection Order against me?? When asked, Grace refuses to talk about it because apparently what I wrote was too much for her to bear repeating. It is that lethal (don't forget it has the power to cause loose stools). Or is it because the conversation we had, when shown, will show exactly who is harassing who? 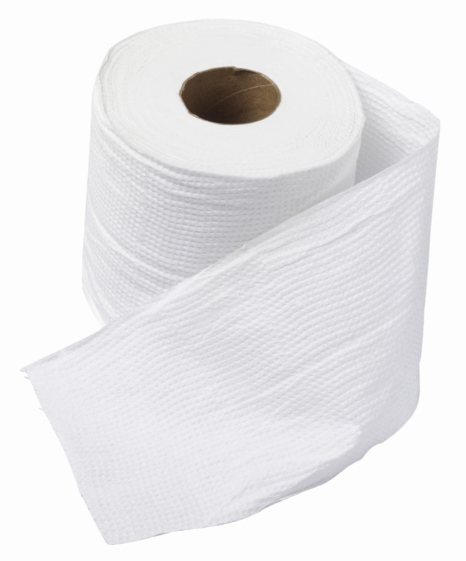 Today, I will clarify my entire history with this person, whom I hope now has a healthier digestive system. In November last year, I was engaged to host a Lee Kum Kee video with Dr Leslie Tay of ieatishootipost fame. The good doctor, who loves food, actually came up with 4 recipes to cook 3 dishes and 1 soup for a fast home-cooked meal in half an hour. 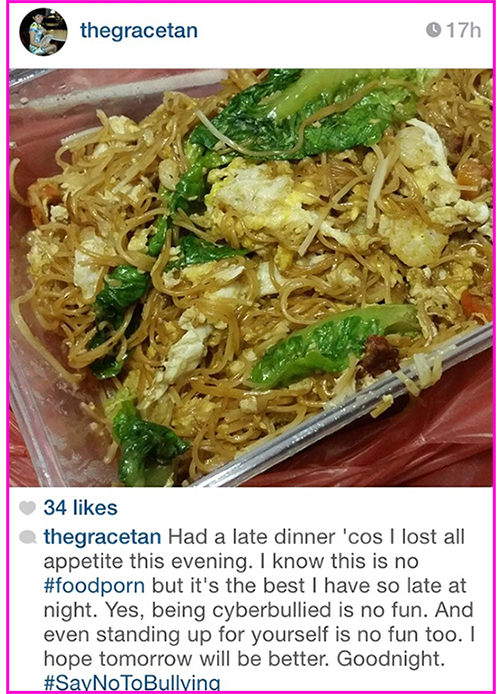 The reason why it is so speedy is because he is using Lee Kum Kee's instant sauces to cook them. When I had the meeting with the producers, I asked if it is indeed possible to finish cooking everything in half an hour. They said that Dr Leslie had successfully tried it at home. I believe them. 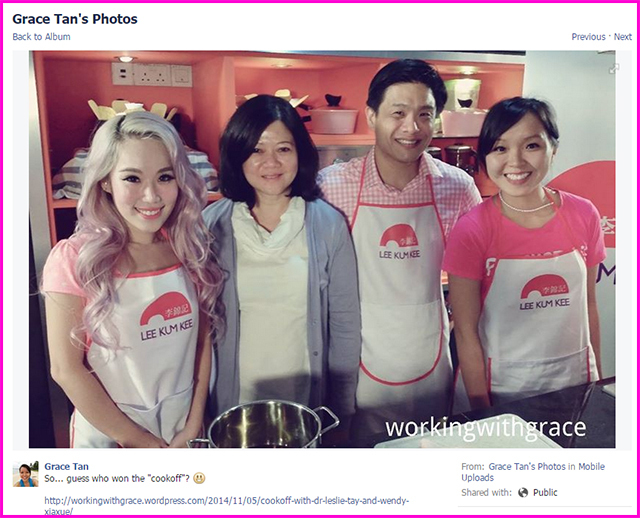 Meanwhile, Lee Kum Kee had held a contest so that a guest can appear on the show to cook with Dr Leslie and myself. That guest was none other than Grace Tan. 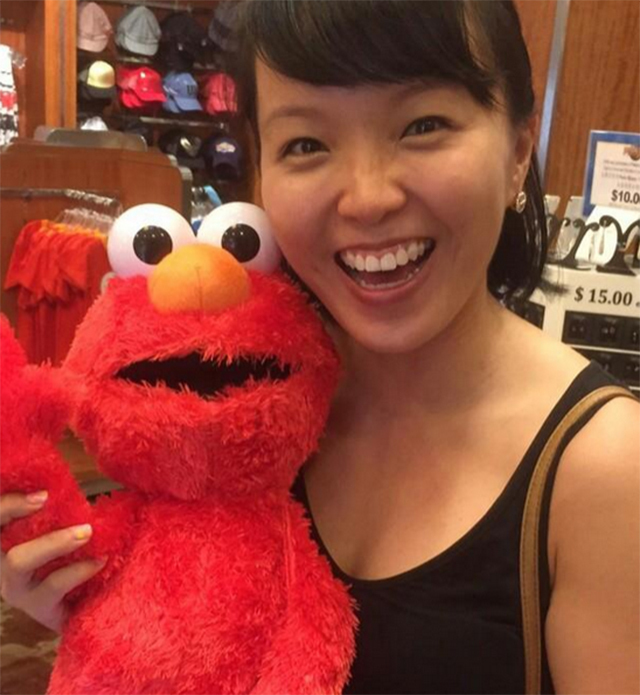 This little meeting with her started a volley of posts from Grace Tan about me. I will show, in chronological order, all of these individual posts she has made and whether they are positive, neutral, or negative. On the filming day, Grace appeared to be nice, meek and polite. She seemed to me like the average girl next door... probably has an office job in something administrative, applied for a BTO and waiting to get it, would bake a cake for her colleague's birthday which she genuinely remembered and not just because facebook reminded her. You get the drift. I actually liked her and I was nothing but nice and friendly to her. She asked for a picture with me and I gladly obliged. I didn't know she was a blogger, the producers told me she was just a person who won the contest. Not everyone gets a dedicated blog post you know! 5th Nov 2014: (Excerpt) Grace blogs about the cookoff. Here's the full original post before she changed it. She talks about the cooking video a lot and put a permalink on her sidebar. It seems to be some sort of trophy win for her to win a cooking contest. she claims willingness to pay a huge sum of money if I would mentor her. Don't like this give me such high praise, I am shy! 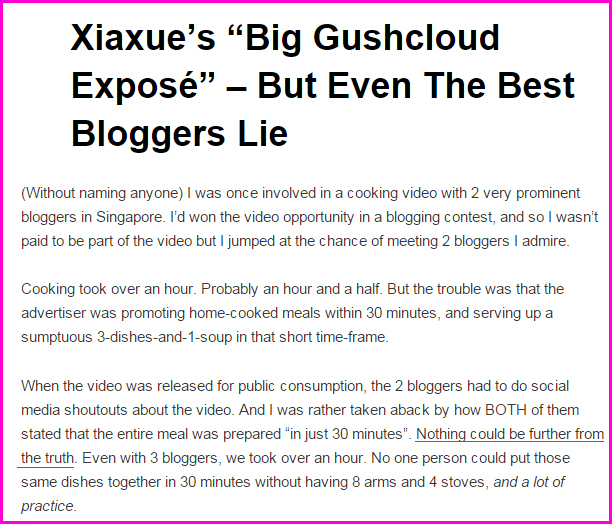 Suddenly, I don't know why things changed on 23th December when the Gushcloud expose came out, but she out of nowhere decided to blog about the Lee Kum Kee incident, claiming "even the best bloggers lie" just below my name, insinuating I am a liar just like those I've exposed. Grace is claiming that the filming didn't take half an hour but roughly 1.5 hours instead, so I am lying to my readers. It doesn't matter that she didn't mention my name, everyone could tell it's me. I decided to just ignore Grace. Ok I took this printscreen from Grace's post. I actually cannot find this comment anymore as it is lost in the sea of comments on my facebook page. I did call her a B***h which is very mildly abusive (to people with sticks up their butts I guess) so I shall redact it. But other than that, I was simply explaining myself and didn't talk about her. I DEFINITELY did not instruct my blog readers to attack her or bully her in any way, despite how she treated me. In what appeared to me as an effort to use the Gushcloud saga to get more blog hits for her blog, Grace wrote nasty accusations about me, when I was NOTHING BUT NICE TO HER. What I felt was in really bad taste is that not only did she say untrue things about me, she conveniently also did the same to Dr Leslie Tay and everyone from Lee Kum Kee and threw them under the bus, insinuating we were all dishonest. These people had done nothing to her. Dr Leslie Tay is one of the nicest people I've met and we all know how important reputation is to a doctor! If she genuinely felt so strongly that I'm a liar and that what we did was wrong (I insist it isn't), she could have easily walked away from the filming or blogged about my lying earlier. But she didn't, why? Why only when the Gushcloud expose came out? Is it because of the extra hits?? Grace saw my replies. She edited her post to include my replies, and wrote many snide remarks about me. It includes her accusing me of being unprofessional because I was late, surreptitiously including a link to ask everyone to read SMRT's expose of me, and lots of blabber about her "awards" and how mine are given by my own company and therefore mean less than hers. Yeah yeah you very much more recognized than me as a blogger ok, give you win. I didn't even read her update (till after I got her PO summons) and I didn't respond to her. Because you know... insignificant to me. 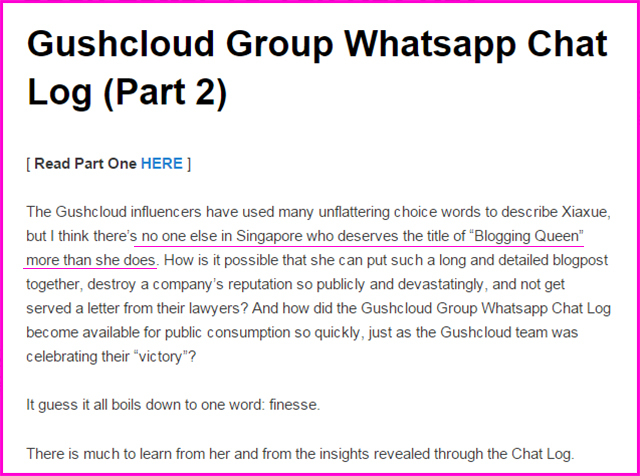 26th Dec 2014: (Excerpt) Grace blogs again about my Gushcloud expose. about the whatsapp chat leak, and once again borders on reverence for me. 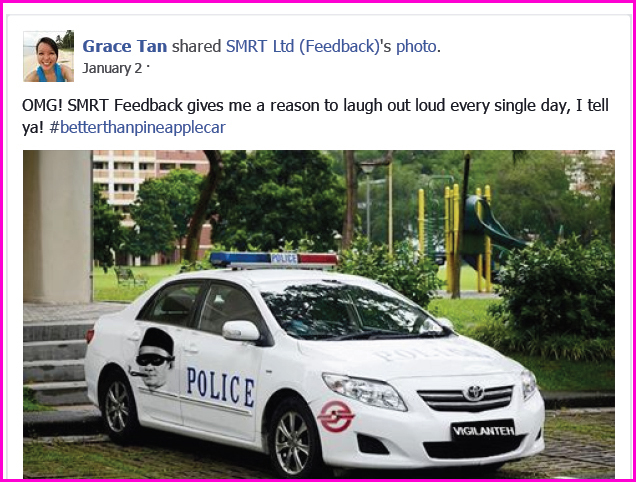 On the same day, 27th Dec 2014, Grace shares SMRT Feedback's nasty post about me. 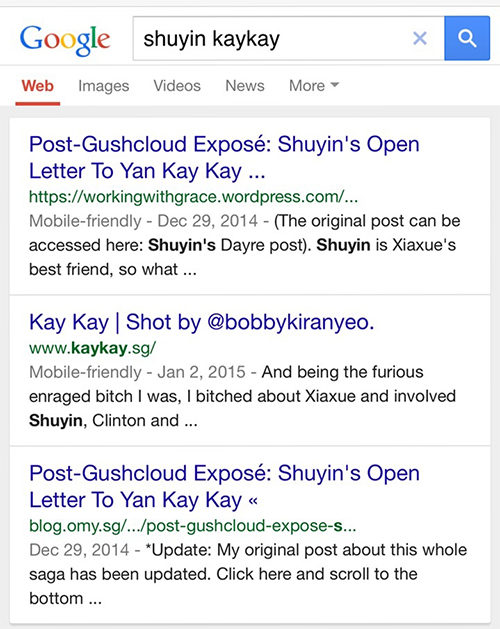 Two days later, on 29th Dec 2014, Grace copied Shuyin's dayre post, which is an open letter to Yan Kay Kay, word-for-word wholesale on her blog. 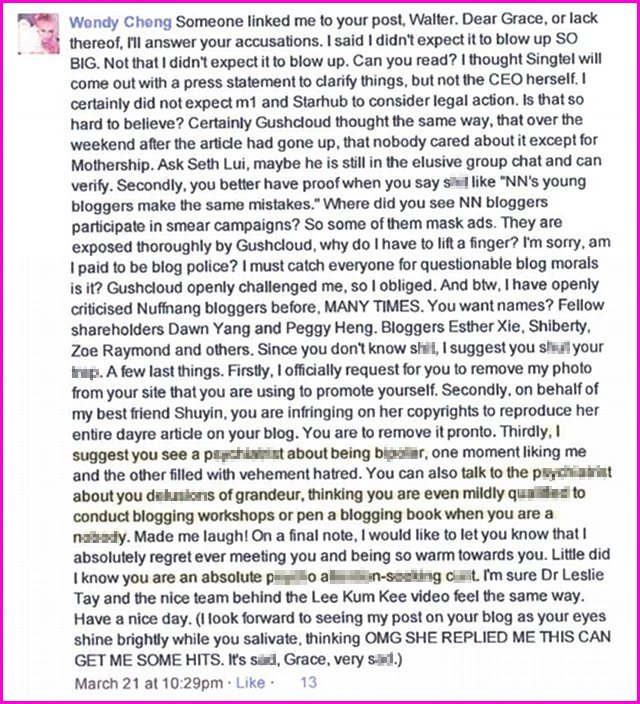 Now, I am not Grace, and I cannot say for sure her intentions of reposting Shuyin's post. 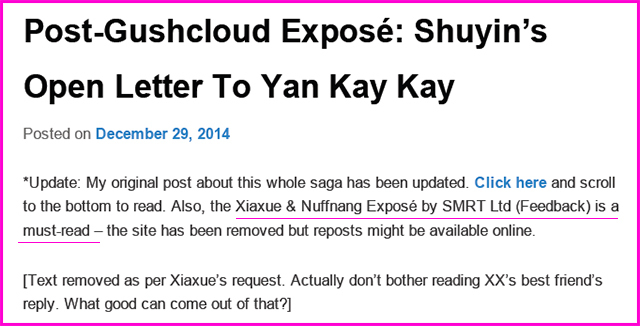 But if you asked me to guess, she probably realised that this article of Shuyin's had gone viral. The dayre post had no title, which meant its url is something like http://dayre.me/mystylemsong/723782734.htm - with no title, the article is basically unsearchable in google. Basically, anyone who wanted to read the article would be lead to Grace's page, giving her additional hits. It is smart and opportunistic, I'll admit. 30st Dec 2014: From being in awe of me just 3 days ago, she inexplicably decides that an article that's full of arrant rubbish is better than my Gushcloud expose and decides to link it. The SMRT Expose 1.5 got her so excited she made 2 posts about it on her New Year. Maybe her New Year's Day wasn't very exciting. The next day, Grace again makes 2 more posts about me... Eh... why you keep talking about me nonstop?? 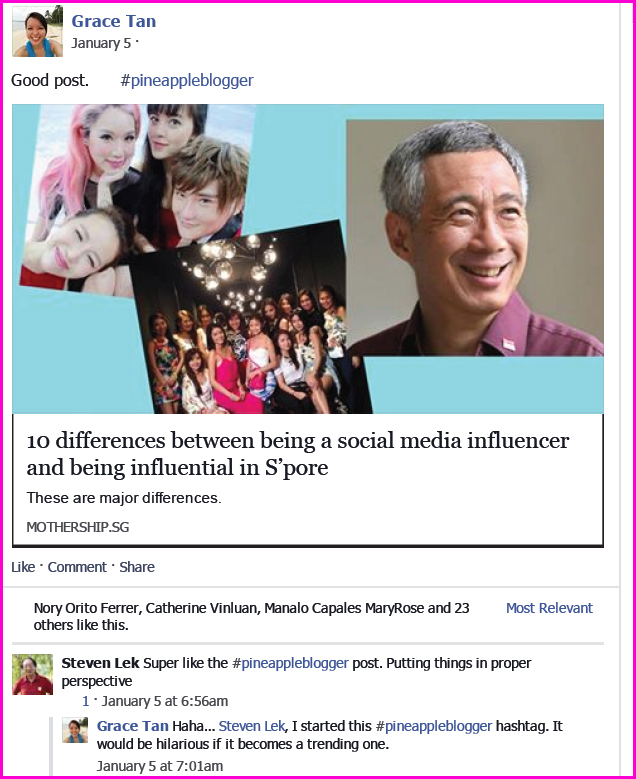 2nd Jan 2015: She says I am not Asia Pacific's top blogger and that it's "self-proclaimed". 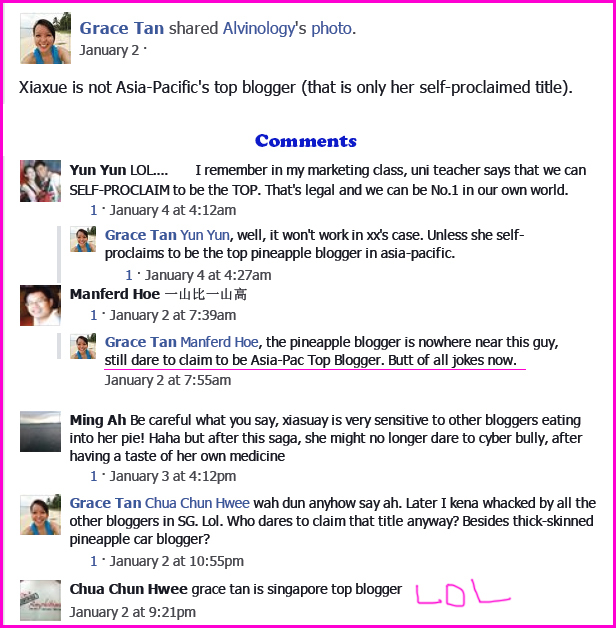 And LOL at the Chua Chun Hwee fellow's astute observation that Grace Tan is Singapore's top blogger. Yes she is! in yet another snide remark about me. 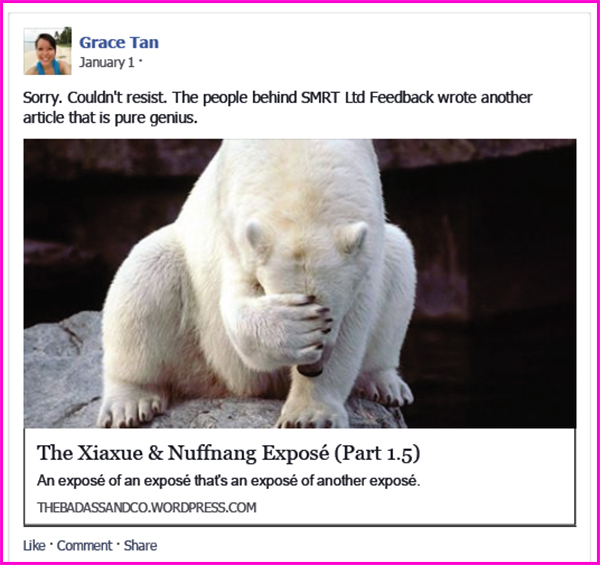 Grace links a defamatory facebook post of her ardent love SMRT Feedback and claims I'm actually breaking the law. Unless Grace has proof (and I'm sorry, hearsay on a highly disreputable website written by idiots don't count), how can she spread a baseless statement like that about me? 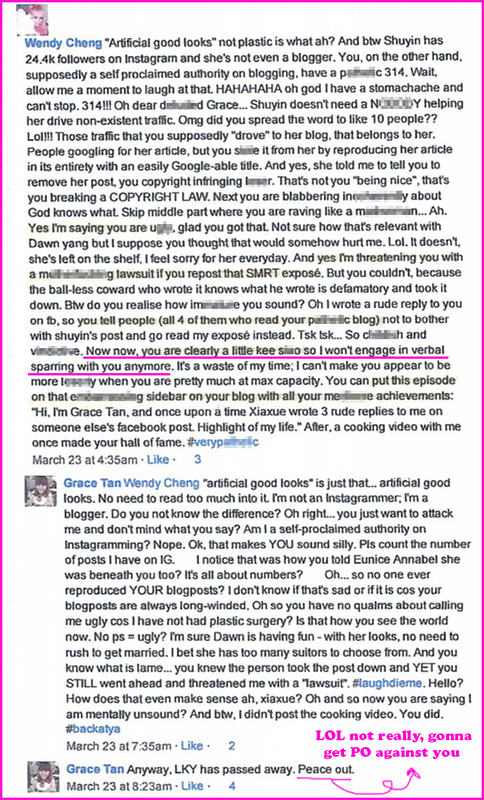 Now, I've showed, with proof, of 22 separate posts (both on her blog and facebook - not counting comments on those posts) that Grace Tan have wrote about me or mentioned me in a span of 2 months. Sometimes, I'm on her mind so much that she even blogs about me more than once a day!! I would like to emphasize that till this point, despite all she wrote about me, I DID NOT RETALIATE OR RESPOND IN ANY WAY. The only time I ever mentioned her or in fact, cared about her existence, was the post I showed where I explained the Lee Kum Kee situation to a reader. Even then she wasn't my concern. My concern was explaining to my reader what actually happened during filming. While she used her public platforms (albeit limited popularity although supposedly award-winning) to spread untruths and offensive articles about me, I have never abused my popularity to attack her back. Honestly, I didn't even know how to respond to her because on one hand she seems to like and respect me, and on the other hand she seems to hate me and despise me. On 21st of March 2015, a guy named Walter Lim (I don't know who he is) linked up a Straits Times article on his facebook page. 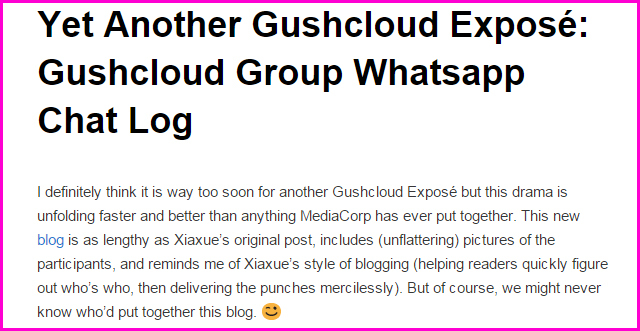 The article is about my Gushcloud expose 2. Unprovoked, Grace decided to attack me (again) with two very invalid accusations. I was quoted in the article as saying I didn't expect the Singtel matter to blow up THAT BIG. Further down the comments, Grace admits she plans to "go to war"
with me after setting up a committee. A friend of mine linked me to this Walter Lim's facebook post. I got incensed, so I replied. Honestly, there is only so much one can take. I replied her comment with my personal and very private facebook account, not my public one. Insulting/abusive words are redacted. Don't want to have her say I'm harassing her again. Sorry you have to read this inane crap but since Grace Tan claims I am harassing her and cyberbullying her I must show everything that transpired between us, right? Ok so that's the end of our stupid facebook tiff. As I wrote the 3rd comment, it occurred to me that Grace Tan seems unable to debate logically so this was a major waste of my time. Most of the time I had no idea what she is talking about. What students?? Why suddenly talking about Dawn Yang or Eunice Annabel??! WHAT'S GOING ON? "Now now, you are clearly a little kee s**o so I won't engage in verbal sparring with you anymore." This is me saying I have said my piece and vented my frustrations, so I'm not going to retaliate any further. True to my word, I never did. In other words, she knew that I wasn't planning on "harassing" her again, yet she still went ahead with wasting the court's time. After this, Grace went to file for the Protection Order, claiming I harassed her and cyberbullied her. Grace's Originating Summons and Affidavit are very entertaining. These are public court documents, accessible to anyone who wishes to read it, so I am reposting my favourite bits here. After Walter Lim incident, Grace got very busy! She didn't really "peace out", there's loads to do! This includes our grieving Prime Minister, WHOSE FATHER JUST PASSED AWAY ONE DAY AGO. Wow, how sensitive. Also, the Minister of Law, and the Deputy Prime Minister. Because who cares if your father just died? 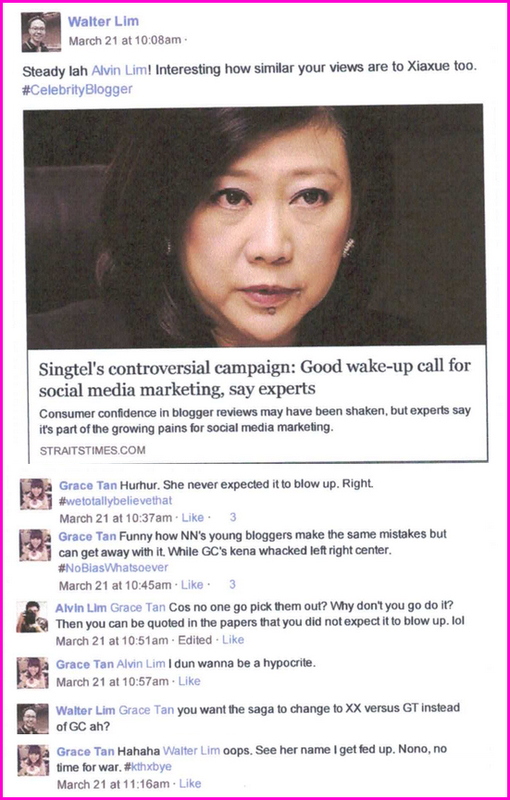 Grace Tan is harassed and that should be the top priority. In this email Grace carefully crafted, there is absolutely no mention of the numerous times SHE has harassed me and cyberbullied me (hey, she's an award-winning popular blogger you know. Poor me), nor how she had provoked me into replying her and later she had the last word. And wow, I didn't know I got Protection OrderS against my VICTIMS!! I'm sorry, but HOW is SMRT Feedback a victim of mine?! They - or he, could be just one schizophrenic dude pretending to be many - are anonymous and the anonymous cannot be insulted or harmed. And of course, showing the court your opinion that the courts have somehow allowed me to abuse the judicial system under their nose is a very clever idea indeed. I cannot think of a better use of our law enforcement's time. Again, no mention that she insulted me first. She even tried to make it seem like she didn't insult me just because my name was not expressly stated. Putting my name there is irrelevant as everyone knows she is talking about me. My name was in the freaking title of Walter Lim's post. Is her motive to lead everyone to believe I fired the first salvo? In the affidavit, she also included many other testimonials to how fantastically awesome her book and workshop are, although how they are relevant to the case I have no idea. However, Grace seems to have cultivated a habit of doing that so I suppose at every possible avenue she must. She also included articles and emails of people who don't like me saying I am a cyberbully. Eh... ok.
My legal counsel was very perplexed by her affidavit. After filing the PO, Grace took to her blog and wrote about "suing" me. This obviously isn't accurate as she is merely filing a Protection Order. The post has been taken down but you can read it here. 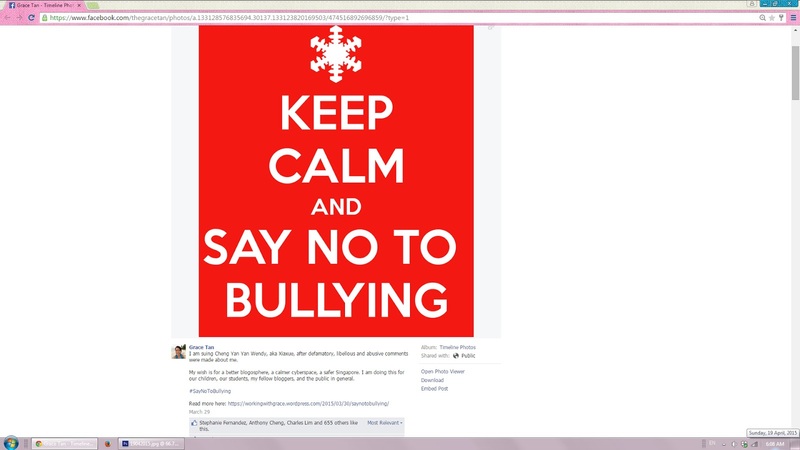 The post includes a graphic of a snowflake symbolising me and the text "Keep Calm and Say No to Bullying". The news outlets got to hear of this and one after another erroneously reports that I'm being sued. Reeling, or because if everyone sees the Walter post they can tell who is really harassing who? Why are you reeling Grace? How I reacted towards you (till before this post) is very mild compared to what I have done to others, and you know this. To claim shock from my reaction is ludicrous. You do not poke a sleeping dragon in the eye and then say you are surprised and offended at the dragon's typical dragon behaviour. You claim you are extremely terrified of me, that I cause you health problems, but yet you continue to attack me, time and again. This behaviour is extremely perplexing. 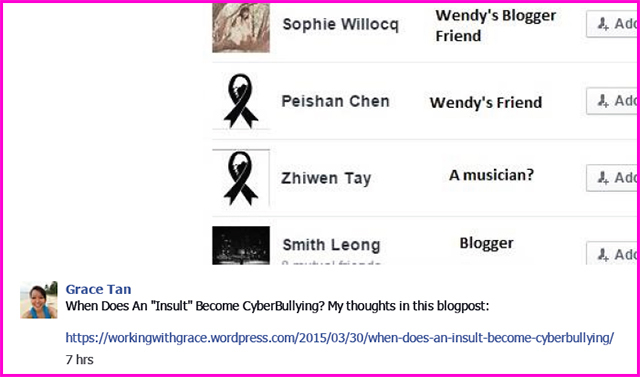 Just one day after the mourning period, Grace invokes Mr Lee Kuan Yew's name for her righteous campaign to end Cyberbullying. DON'T FORGET TO PROMOTE YOUR SOCIAL MEDIA!! IT'S NOT EVERYDAY YOU GET TO BE ON NEWSPAPER!! And yes, it is totally logical that if you believe in Saying No to Bullying, you should follow Grace on instagram. That same day, Grace blogs a second blog post about the PO. Very hardworking this one. 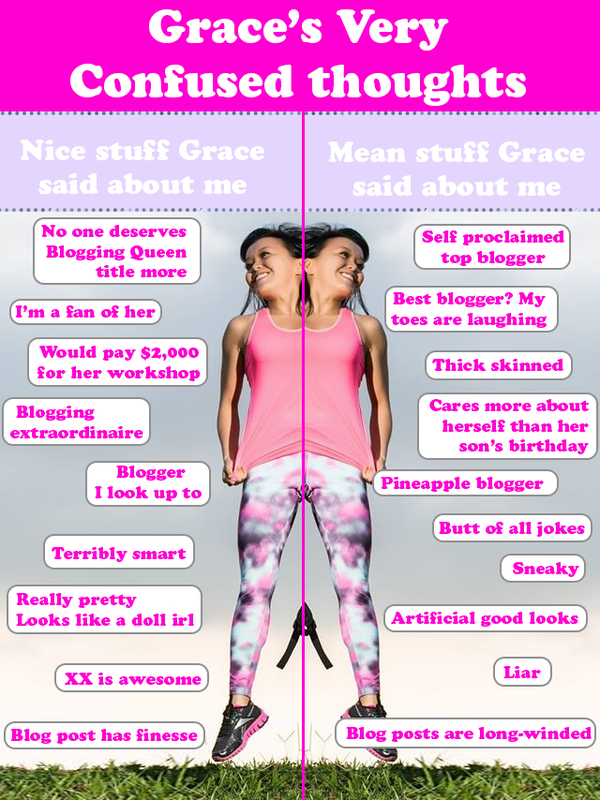 30th Mar 2015: (Excerpt) Grace blogs about how I've been attacking her "FOR A LONG TIME". 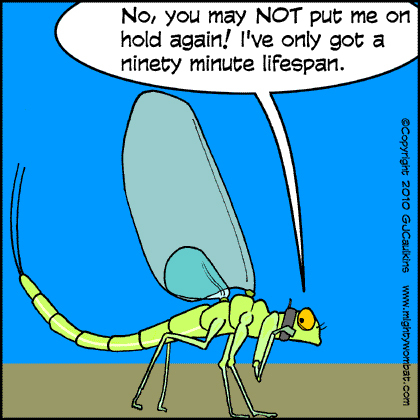 Yes because 3 comments over the span of 2 days is a super long time... To a Mayfly whose entire lifespan could be over in that time. And of course, your "advertisers" (which I'm sure are plenty), all read Walter Lim's PERSONAL facebook timeline and would have noticed that ONE post of his where I left you a few comments. That makes sense. As for mental illnesses, I'm sorry I called you bi****r, Grace. It is now clear to me, that based on your actions, you are a fully sane person. You obviously do not have a debilitating mental condition which makes you go from mania to depression and back again. Your actions of going to war with me, writing rude emails to my lawyer, believing you can take on the world; that's bravery, not mania. Your actions of how you suddenly get health problems, stating you cannot eat or sleep, or wishing repeatedly this saga is over, only to adruptly fan it again - that's not depression, that's simply normal for someone going through what you are going through. Therefore, I apologize sincerely for calling you bi****r. You do not display the symptoms at all. For the most part, I felt that Grace's post was full of self-righteousness and blatant self-promotion, so when reading my eyes begin to glaze over. But one part made me really, really angry. Grace took screenshots of everyone who liked my Walter Lim comment (14 likes) and wrote her own descriptions of who she thinks they are and how they are related to me, in an apparent attempt to name and shame them. She even included the companies they work at. WHY MUST INCLUDE THE COMPANIES? You want to get them into trouble at their jobs?? For liking a facebook comment?! People can like my comment for a myriad of reasons. It can be that they like that I'm finally standing up to a hater who has wrote nasty stuff about me for a long time, and by long time I mean not just 2 days. It can be that they are a fan of my witty humour. Maybe they like my rapidly-changing hair. It can be that they just don't like you. It can be that their baby accidentally pressed the phone. It can be that they agree with a single valid point in my comment. Like Smith Leong (in the list) verified, he isn't a supporter of mine, he just liked my comment because he liked how I said I have also insulted Nuffnang bloggers and felt it was a valid point. In her affidavit she even put up a printscreen of my mother's personal details. FOR WHAT YOU TELL ME? And for her to accuse my mom of "supporting a vicious attack" is totally baseless. Firstly, you don't know WHY she likes the comment, maybe she didn't agree with some of the more vulgar language but she supports my stand. Certainly my mother doesn't owe you an explanation. And why must Grace point out those two likers who are new moms??! WHAT HAS THAT GOT DO WITH ANYTHING?? Why is she trying to insinuate that Elaine Woo is a bad mother who went to like comments on facebook instead of being busy caring for her newborn?? OMG SERIOUSLY I'M SO FURIOUS I CANNOT. GRACE TAN MUI GEK, YOU ARE NOT A MOTHER AND YOU HAVE NOT GONE THROUGH MOTHERHOOD. So do not presume to make assumptions on how mothers spend their day or how they should behave. Who died and made you an authority on this? Most of these people aren't public figures. For Grace to names and shame all these innocent people who did nothing but like a facebook comment, and then claim to be an advocate and martyr for anti-bullying - well that is rich and ironic. Wait you post up their identities on your award-winning blog they get loose stools how? How would you like it if I posted up a picture of your fiance here and said where he works?? (Excerpt from blog) Grace wants her drama-free life back. Yes yes, you want it all to stop... You don't have time for this, but you have time to file two police reports, write to the ministers, and file a Protection Order. We believe you. Because you'd think someone who doesn't want drama and has better things to do will take a hiatus from the internet instead of posting more more more!!! 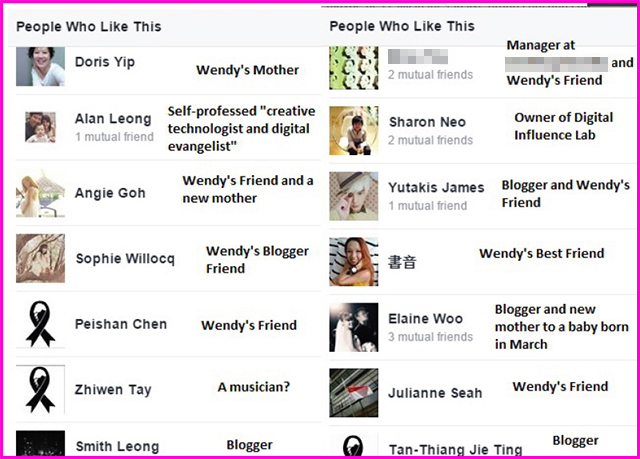 30th Mar 2015: Grace reposts the offensive picture of the "likers" on her facebook. Grace ends the blog post by telling us she is super considerate by not ruining Dash's birthday because she is SOOOO kind-hearted. Once I got your case, I referred my lawyer to handle it. Initially, I even thought of not even appearing for the hearing because I was that confident that an aggressor will not be able to obtain a PO. That would be most unjust. But since you publicized it and the media took interest, I decided it's best to lawyer up. After midnight on the 30th, I stayed up all night after Dash went to bed to find the links of all the above 27 posts you made about me and screenshot everything. At 8am I finally finished, after sieving through many of your posts which I must declare is a supreme waste of my time and quite dull work. I might have watched an episode of House of Cards in between. I sent the evidence to Wei Li and he took over. With barely a few hours of fitful rest, I dragged myself awake and took Dash to the Zoo to celebrate his birthday as I promised. We spent the whole day there and had a smashing time. Then pay them for what?? Word of advice Grace: If you don't like this saga, maybe you can, I don't know... KEEP QUIET ABOUT IT? Just a suggestion. Maybe she's referring to me since my Chinese name is Yanyan. 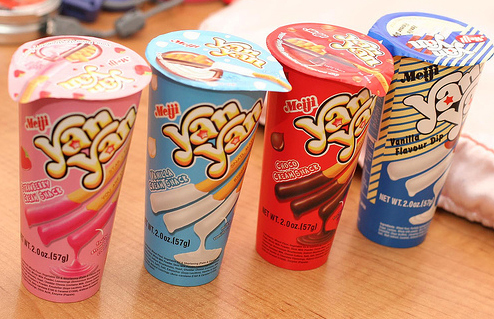 Or maybe she's referring to her other friends Pocky or London Choco Roll. 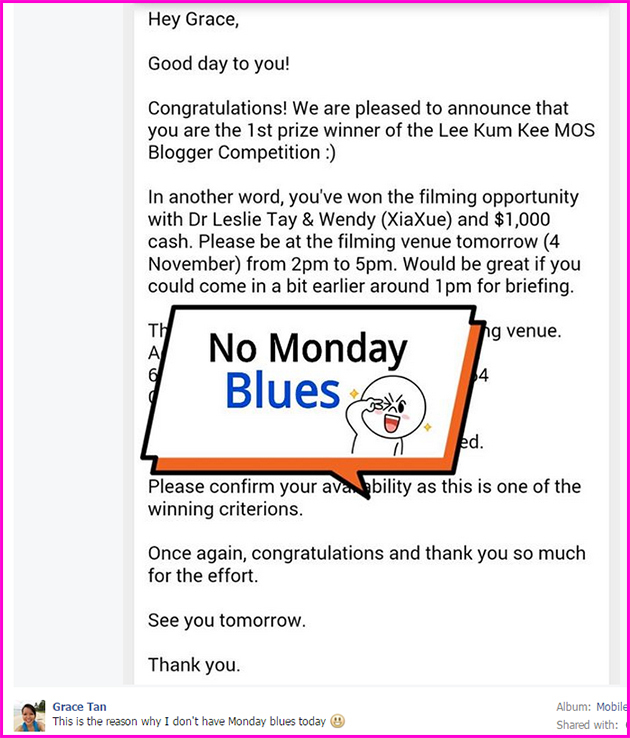 She seems to take her own advice well and bragged many times about the Lee Kum Kee Cookoff, putting it as a badge on her sidebar. Again and again Grace claims she wants her drama-free life back and that she hates every moment after she decided to make very public her quest for a PO against me. She didn't have to repeatedly blog about it, accept media interviews or keep talking about it on social media. I have kept very quiet, so there is no need for her to be perpetuating and prolonging the saga. IT SAYS RIGHT THERE IN THE DEFINITION. To claim someone is bullying you, they need to have more power than you. Again and again Grace claims I bullied her, but I never did. Many people can say I cyberbullied them, but not Grace. I used my personal, private facebook account to comment on the Walter Lim post, not my public one. She cannot claim cyberbullying, because I have never once directed my readers to attack her. She and I are equals on that platform, since both of us were using our private facebook accounts to comment. Using her award-winning blog, she has repeatedly shamed me and insinuated that I am oppressing, badgering and bullying her without cause or reason, and should be viewed by the public as some kind of menace and tyrant. She named and shamed the people who liked my facebook comment. I don't care if, in the past, there have been instances of me "cyberbullying". You call it cyberbullying I call it standing up for myself. But whatever, call me a cyberbully if you wish. BUT THE ISSUE HERE ISN'T ABOUT WHETHER OR NOT I'M A CYBERBULLY. 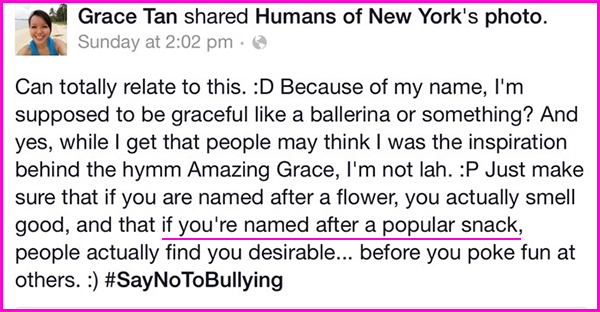 The issue here is that I NEVER DID BULLY GRACE TAN, so it's not for HER to claim that I am. That is a LIE. And besides, I think that she has no rights to chanting the anti-bullying mantra, based on her own behaviour. Sorry this blog post is so bloody long. Shockingly enough, Grace appointed solicitors 1 day before and then didn't even bother to turn up. What happened to #SayNoToBullying and its importance? During the pre-trial conference, the Judge said she isn't inclined to make a decision, and advised lawyers to settle out of court. After discussion (which was made difficult since she wasn't physically there), certain terms were came to for a settlement. Grace will withdraw her PO application. Grace will remove all the offensive articles she posted about me in their entirety, and I will in turn not sue her for defamation. We both agree not to post any insulting, abusive or threatening communication about each other. Now, I am advised by my lawyers that my case is very strong. If I didn't want to agree to these terms, it is very likely that she simply won't get her PO at all and I will win the case. However, the Judge has said that if we cannot settle, she will order mediation sessions. If those don't work, finally a PO hearing. This wastes time, maybe months, and lawyer costs will run very high. After which, if she fails to get the PO after the final hearing, the law may allow me to claims my legal fees and disbursements from her, which can amount up to FIVE FIGURES. Anybody else similarly thinking of frivolously applying for an unjustified PO against me, please take this into consideration. It seems a high price to pay for publicity. The only con of me agreeing to settle is that it might seem like a victory for Grace to have achieved the same aim as if she got the PO - that I don't write nasty stuff about her in future. But there is one HUGE difference. The difference is that I agreed to doing that ON MY OWN VOLITION. It is out of charity and goodwill that I decide to agree to that, not that the court agreed that I harassed her and forced me to. There is no reason for me not to agree, since I have already said she is nothing to me and very dull a subject to write about. It comes at no loss to me since I do not plan of giving her any more of the publicity she seems to crave. And in exchange, I settle the case there and then instead of dragging it out for months, she removes the offensive and untrue stuff she posted about me, and can't further post nasty stuff about me. It seems like a good deal. We both signed the undertaking. That night, Grace locked up her instagram. Just to be extra safe, she didn't accept any new followers. Furthermore, since I don't know anyone who follows her on instagram, there is no way for me to verify that she removed the offensive posts on instagram or posted new nasty comments about me. She seems insincere in fulfilling her promises. I regret settling and I should have gone all the way, and made her pay my legal fees. I cannot believe I had to deal with all this asinine crap, wasting both me and my lawyer's time. I don't attack people unless they provoke me first. People insult me on a daily basis and every single day I make the choice to let it slide; to be the bigger person. But I too am human and sometimes, I do get angry. Grace Tan had wrote about me negatively 11 times on separate occasions (if you count Walter Lim comments as 1) before I finally snapped and replied her. My reputation has been thoroughly sullied by Grace Tan. Not because she is so popular and everyone reads her or anything but because the mainstream media picked up the news and misreported it. I have a responsibility to explain to my readers who are asking me what happened. I am writing this post, not to harass her, but because I have a right to defend my reputation when it is being maligned in a widespread fashion. And true to the undertaking I've agreed on, I have tried my best to make this post factual. None of my usual vulgarities, yeah? 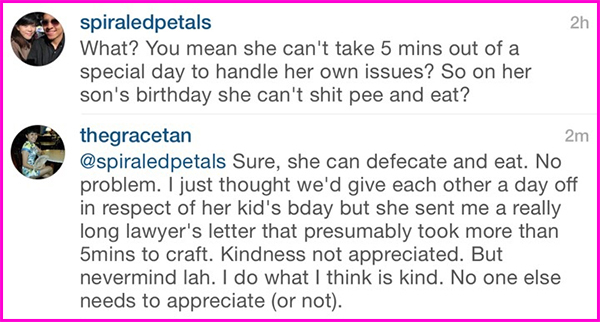 I would like to clearly state that after today, I will not be commenting on Grace Tan any further. I am not interested. She is insignificant and unimportant to me and is therefore not worth any more of my time. Dear Grace, I hope you are pleased with the publicity you have gotten with this episode. 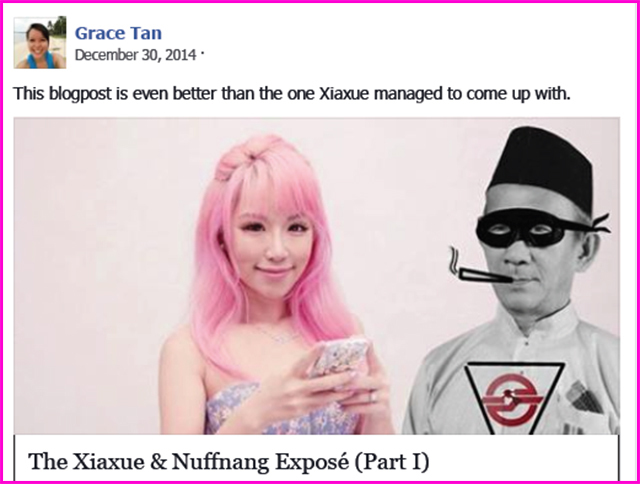 When people talk about Grace Tan in future, maybe they will remember you as that blogger that sought a Protection Order against Xiaxue only to withdraw it? 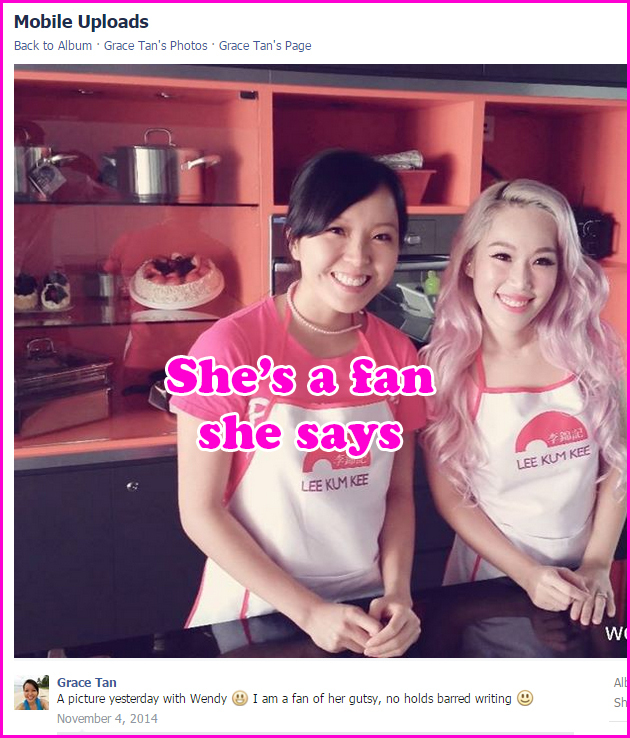 Or maybe they will remember you as that blogger that Xiaxue caused to have loose stools? Hope your stools got firmer my dear.